Exhaust wrap is the first step in controlling underhood temperatures. This product is designed to keep heat in the exhaust and evacuate it out of the engine compartment. Wrapping your headers will reduce underhood temperatures by up to 50% while providing additional horsepower, engine protection and passenger comfort. 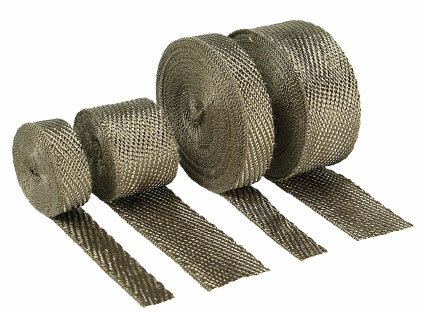 All exhaust wraps are not alike! DEI is also the only manufacturer to add 1.25" guidelines to ensure proper installation without the guess work. Why only a ÃƒÆ’Ã†'ÃƒÂ¢Ã¢â€šÂ¬Ã…Â¡ÃƒÆ’Ã¢â‚¬Å¡Ãƒâ€šÃ‚Â¼" overlap, isn't more better? QUESTION: how well does the heat wrap hold up on a motorcycle? rain, washing etc. does holding in the heat effect the engine after it is shut off? Can you spray the titanium wrap to change the color? ANSWER: Holds up great on cycles. On the black or tan wrap spray with DEI HT coating to protect wrap. Titanium does not accept spray well and no need to spray it since it keeps its color and shine. Heat is not an issue after shut off.